Life is a complex web of creatures and interactions that is staggering in its magnitude and depth. Every little thing to the grandest has a crucial role to play in the cosmos. We may never know how they are all inter-related or how they all depend on one another, but make no mistake the fate of one is the fate of the whole. Alarming it is how blind we are to this interconnectivity. If something is not directly in front of our faces, we pretend as if it does not exist. 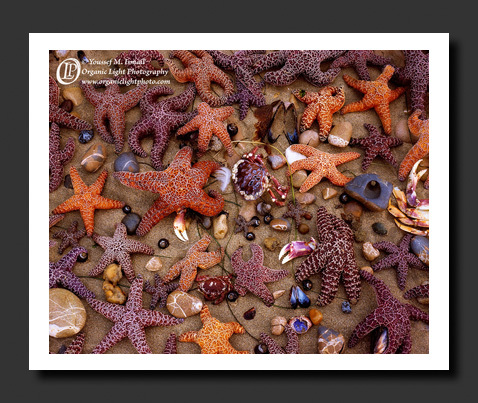 Take these sea stars, for most of us, we know they are real, but how many of us have ever ventured to the seashore at the right time of the month and day to see them just under the water line when a low tide appears? Gathered in a short time one afternoon in late summer by diving and wading into the tide pools left behind at low tide, these sea stars and the other detritus left behind by the receding water has left this photographer and his assistants in a daze seeing stars in everything and everywhere they look, making that web of life sparkle.